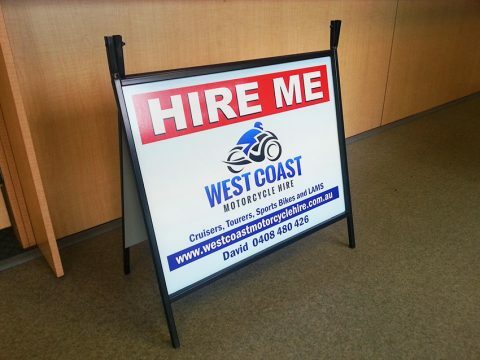 A-frame signs come in many different sizes, and here at Perth Graphics Centre, we make them all. Seen above is one of the flip-fold A-frames, and is perfect for real estate signage, temporary signage or advertising signage. The face size is 600mm x 450mm which means it will fit into the boot of a car with no issues. If you would like a price on a flip-fold A-frame, or indeed any size A-frame sign, Perth Graphics Centre are the people to see. Click here to contact us for a quote. Hi there, I wonder if you have the A frame which is about 2m high and 1m width? If you have, how much it will cost for 2 pcs? But if you do not, please also advise the price for similar size. Thanks for your comment. The closest size we have in stock is 1800mm x 1200mm. Please email us for a price by heading to our contact page.